> > to get to say kwrite. > Note the "Remember application association ... " At the bottom. > Also not the text bar at the top, where you can write the name of the binary directly. > > present what ever is clicked on. > > 5.26 ? Associations aren't on as some have no suffix. > Why are forums read from top to bottom? Yeh - I wondered about should be top posted too but the idea is that some one reading can get all info by reading one mail top to bottom so I bottom post. There is some mileage in Dunken's all probably more than I have found so far. I notice though that the all check seems to come last so anything added wont appear in right clicks if there is an association. Adding to the allfiles part as well may go further. 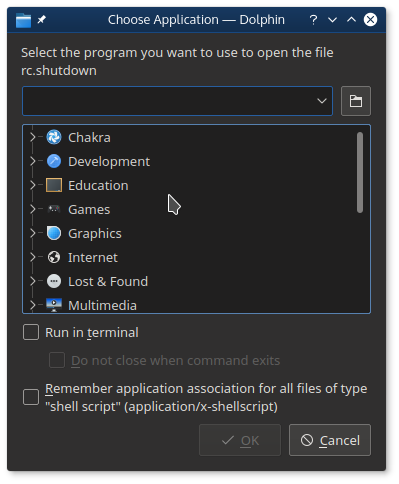 I've been using kde since 2.something and have had problems when I've used the remember the selected association option so I don't use it as I might open all sorts of things and giving those an association can mess things up. It has for me anyway. ;-) I may have used kde for a rather long time but never done much with any scripts that are used in it due to lack of documentation. I lack the directory mentioned in the other suggestion. It might be a user option but no way of telling. Just a note. I prefer list replies and don't mind html as my email reader copes and doesn't allow any funnies. Some don't like them on the lists at all. Rich text would be another option but not usually available other than sending via yahoo. Previous by thread: Re: Options to right click and open to view some how. Next by thread: Trying other desktops in different user accounts.